Cait's Cozy Corner : Budget Friendly Beauty Finds! Happy Tuesday friends! We had such a great weekend with family and friends but I'm ready to get a bit of a routine going today. Sometimes having unmade plans can lead to such a fun time but I'm one of schedule ( hello Type A personality ) so I'm anxious to keep everything running smoothly. I've been getting a few questions about some beauty finds that I'm been finding at some of my favorite drug stores so I thought I would round a few of them up for you all! NYX Color Correcting Palette - This palette is only $12 and I love that it has customizable shades to cover all my blemishes when I need it the most. The formula literally glides onto my face to give me an ultra-smooth finish and keeps it feeling extremely soft. ELF Skincare Starter Kit - I've been looking for a new starter kit now that the summer weather is here and this is the perfect thing I found! My skin tends to be super dry in the summer so this kit keeps it hydrated, glowing and healthy all summer long plus you can't beat the price point! It has a daily cleanser, illuminating eye cream and a daily hydration moisturizer. Each is infused with purified water to keep your skin nourished. It's my new go too! NYX Butter Gloss in Strawberry Parfait - A girlfriend let me borrow her butter gloss the other day and I couldn't stop obsessing over the color! It's the perfect shades of light pink that really gives your lips that extra glow if you're wanting a more subtle look! NYX Professional Drop Foundation - I love a good foundation that I can use year round. These drop foundations are perfect because I don't need to use a lot to get great coverage which makes me use it more! They offer so many different shades so while my skin color may be going from pale to pretty dark in the summer, I can slowly build up to it as the months go on! Essie Ballet Slippers - One of my all time favorite summer nail polishes to wear ( sometimes even year round ). It's seriously the perfect white pink in my opinion. I even wore it on my wedding day! Essence Make Me Brow - This one is actually a friend found and adores so I had to throw it in here! I personally don't need to do anything with my brows besides thread them however my friend always needs a bit of shading and said this was her favorite budget eyebrow gel to use. It lasts all day. Maybelline The Falsies Washable Mascara Makeup - I feel as if I've tried so many different massacres but this one I always come back too! When I wear it helps build about 8x more volume to acheive that falsh lash effect! HELLO BIG EYES! The flexible spoon brush really helps to lift and separate my lashes for that thick look I'm wanting! Coconut Water Cream Mask - When I've had a long day running around after my kids, this mask is always the first thing I grab. It helps to smooth out my skin and remove excess oils on my skin. I love that it helps to minimize the appearance of my pores as well and it only takes about 20 minutes! Wet Hairbrush - I have super crazy and I mean THICK hair so this brush is the only thing that helps get through all the snarls that I have after getting out of the shower! The bristles don't pull at my scalp which is a huge win for me, plus my daughter even lets me use it on her as well. 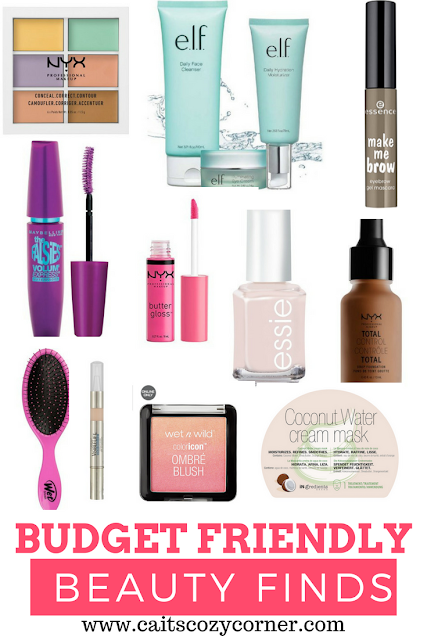 Share with me some of your favorite budget friendly beauty finds! The butter gloss is speaking to me. It's definitely on my list to buy now. Thanks for sharing!!! I love love LOVE the nyx drop foundation, it's so so amazing and light and NOT CAKEY! I have yet to try the ombre blush but you definitely have me intrigued! I recently came across the wet brush and it works miracles! I don't have thick hair but my hair gets so many tangles this has been a life saver! Yesssssssssss! Maybelline mascaras are my go-to for years and i love love love all Essie Nail polishes! Definitely have to try out that coconut mask though! Love a good mask! Great round up! I'm going to have to look into all of these further! I love love love Essie Ballet Slippers! One of my fave shades. So many great picks, friend! I haven't used the Falsies mascara in so long, but I remember it being SO GOOD! I remember the waterproof formula lifted and thickened my lashes so well. Ohh I need to try some of these! There are a few I've never tried before! Love a good post with drug store beauty products! And I'm all about the Essie ballet slippers as well. Such a pretty color!